This is the first post of a series on how the book of Genesis was made. That statement might seem a little weird in that Genesis itself speaks about creation. To get to that there has to be a mechanism for Genesis to be recorded and distributed. That mechanism was writing. Lets recap. In the last blog we discussed how the Bible is made up of many books which I also like to call Chapters since the Bible can be seen as a Holy book with a Beginning and an Ending. It has a storyline and the problem is stated at the beginning which plays out throughout the book and is solved at the end. Lets now look at writing. Writing has been studied by a litany (ha, a pun!) of different types of scientists. There are the Linguists who study language, which is the way words were first conveyed from person to person. The interesting thing about language is that until recently there was no way to keep a record (a recording) of language. It changes over time and one language can morph into another. The only way in the past to capture language was to write it down. But to do that you needed a way to write and something to write on. This leads us to the second set of scientists, the Archeologists. Through archeology we have an idea of how the earliest language was set down (and why). Our understanding of writing started through archeological excavations of ancient cities. The earliest evidence of writing goes back to about 3100 B.C. in the land of ancient Sumer (in Mesopotamia), and about 1200 B.C. in China, and about 300 B.C. here in the Americas in a region known as MesoAmerica. The book of Genesis was developed in this Mesopotamian region, and now I can make our first Bible reference: In Genesis 2 there is mention of 4 rivers. Two of the rivers are the Tigris and the Euphrates. Sumer, the ancient land where writing was invented, lies between these two rivers. The word, Mesopotamia, means in Greek “lands between rivers”. Genesis 2:10 A river watering the garden flowed from Eden; from there it was separated into four headwaters. 11 The name of the first is the Pishon;… 13 The name of the second river is the Gihon;… 14 The name of the third river is the Tigris;…And the fourth river is the Euphrates. 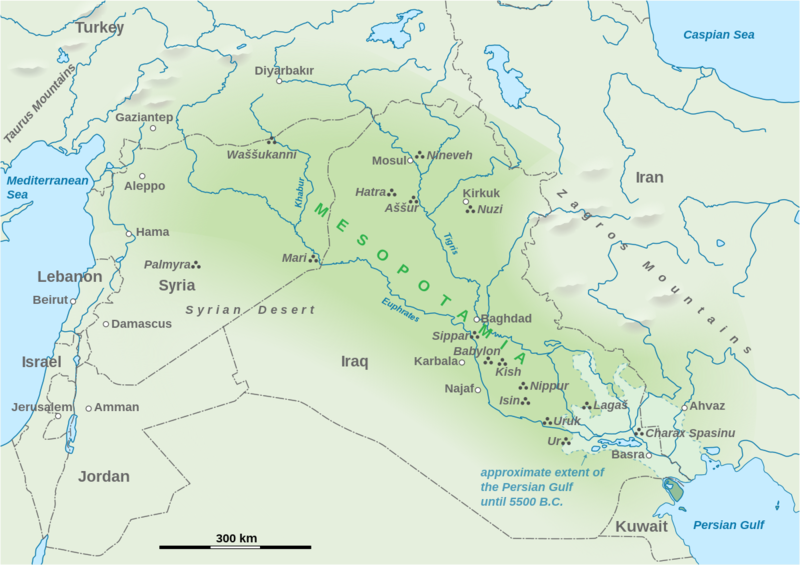 Here is a map; and who doesn’t like maps… that shows the region of Mesopotamia. (Extra credit if you can repeat that word three times fast). Here is a picture of one of the earliest king’s of the region. His name is Sargon the Great. He founded the world’s first great empire (i.e. two or more nations joined together). You can find a reference for one of his ancestors in the Bible in Isaiah 20:1. The name of Sargon is translated as “the king has established (stability)”, or “the god has established the king”. Source: https://en.wikipedia.org/wiki/Sargon_of_Akkad. Our last group of scientists who explore ancient writing are the Mathematicians. Of course mathematicians study numbers. One of the earliest record of a mathematical table of numbers goes back to 1820 B.C. about 400 years after Sargon. The tablet was found in the 1920’s in ancient Mesopotamia near the ancient city of Larsa (modern Tell Senkereh) in Iraq. You can see a picture of the tablet at the top of this page. It is partly broken and is 13cm x 9 cm. It contains Pythagorean triples, i.e., integers a, b, and c and satisfying a2 + b2 = c2. This is the oldest trigonometry table in the world and according to some was used to teach students about math around 4000 years ago. It represents the world’s most accurate trig table tool used for surveying and constructing temples and pyramids like the Hanging Gardens of Babylon, one of the Ancient Seven Wonders of the World. Source: https://www.theguardian.com/science/2017/aug/24/mathematical-secrets-of-ancient-tablet-unlocked-after-nearly-a-century-of-study. There is more to learn about the Sumer’s evolution of language into writing contained in the video: Ancient Writing Video (youtube) link. Bonus data: The Hebrew word for “to write” (kathab) means “cut in” or “dig” (khaw-thar) which is a reference to the ancient practice of cuneiform writing (using a stylus of wood to press into clay) – Biblehub.com. For instance Exodus 32:15 “that the tablets were written on both their sides”. And “cut in” in a larger sense refers to the covenant of God with Man.